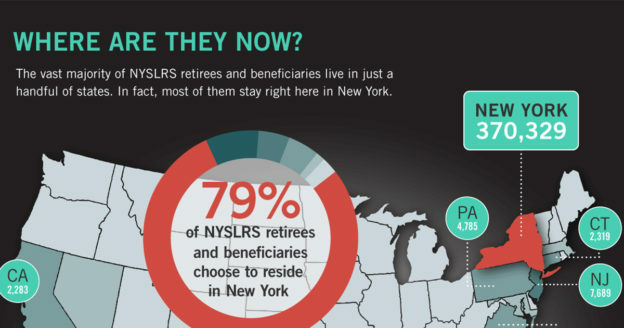 Before they leave the workforce, NYSLRS retirees build careers based — at least in part — on serving the people of New York. They are police officers, firefighters and nurses. They are the countless civil servants working each day to keep government services functioning. Their value doesn’t end with retirement. In fact, NYSLRS retirees and their pensions contribute significantly to the communities where they live. 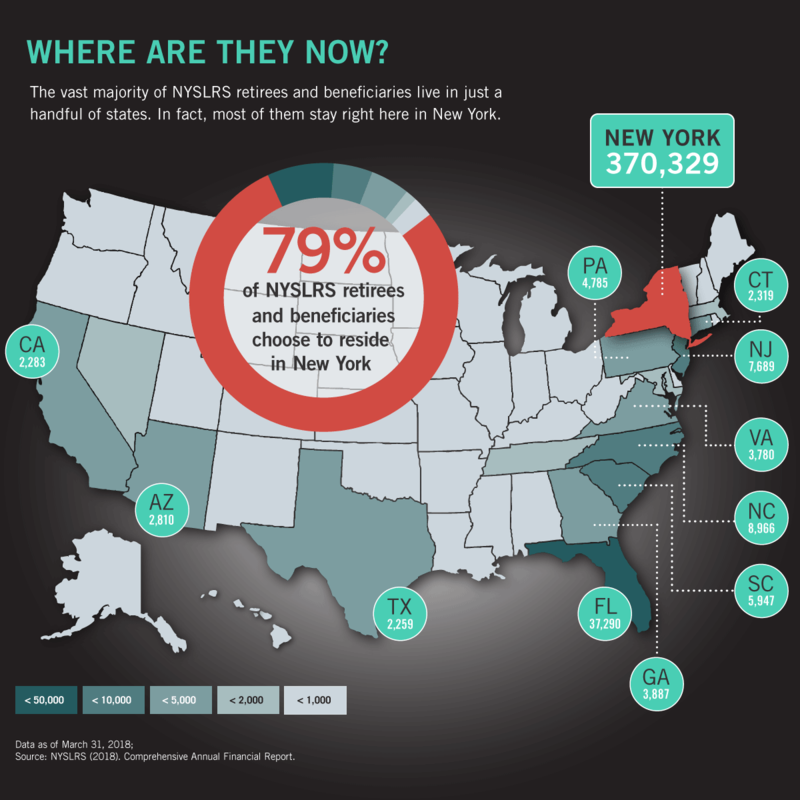 Seventy-eight percent of NYSLRS retirees (440,943 as of March 2016) stay right here in New York. 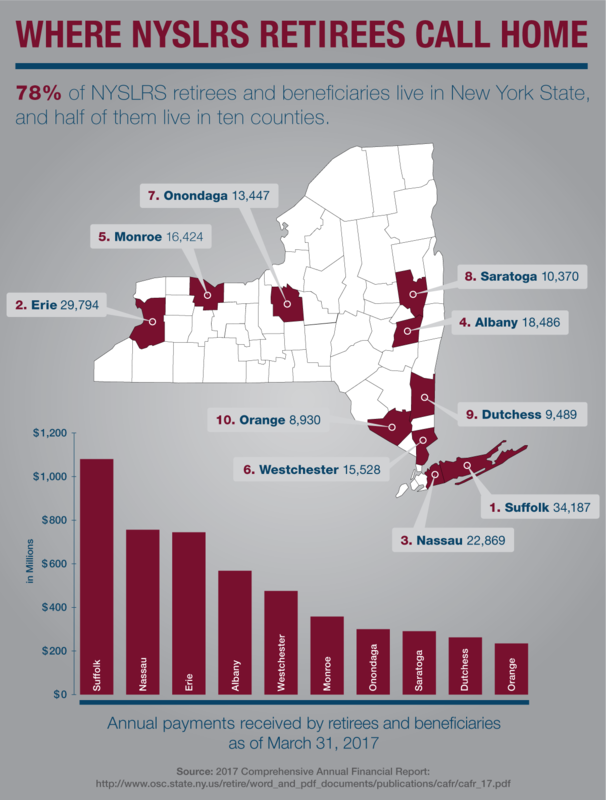 They live throughout the state — from Long Island to the North Country, from the Capital District to Western New York and down to the Southern Tier. 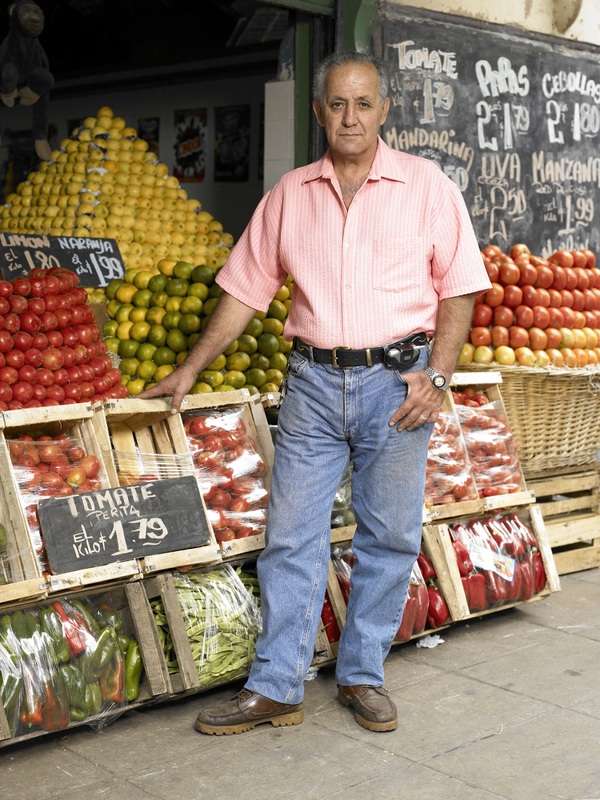 Altogether, they’re 2.9 percent of our state’s population, but in some areas, they account for more than 5 percent of the residents. Property taxes. 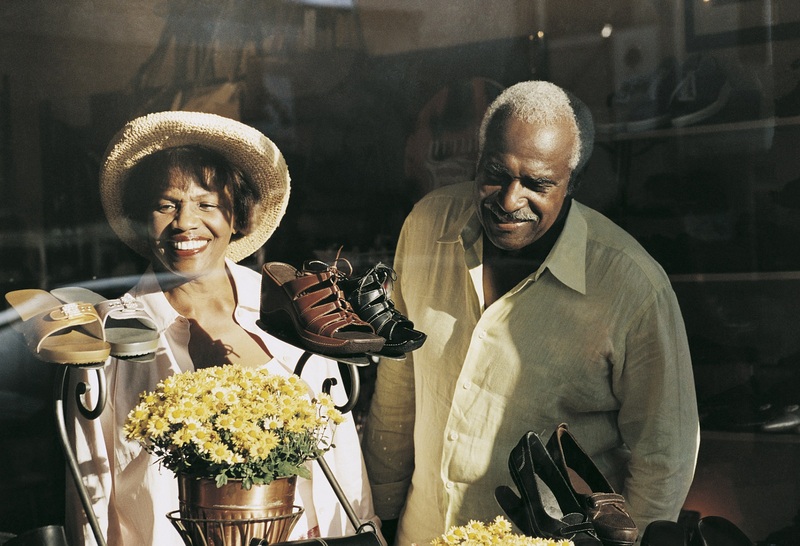 In 2015, retirees paid $1.7 billion in real property taxes. That’s 5 percent of the total collected for the entire state. 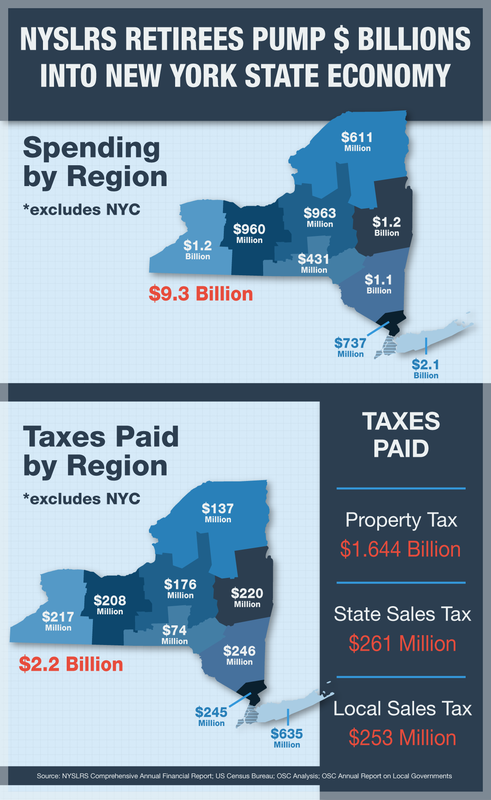 State and local sales taxes. 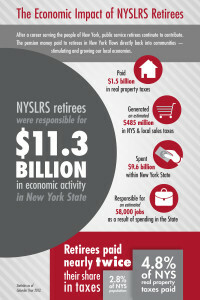 NYSLRS retirees paid an estimated $550 million in state and local sales tax in 2015. Job creators. 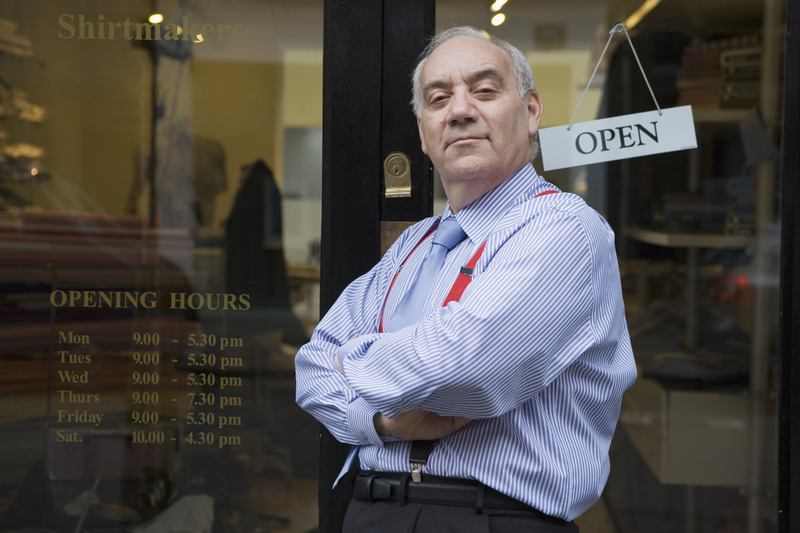 Some retirees do go on to start small businesses as a second act. 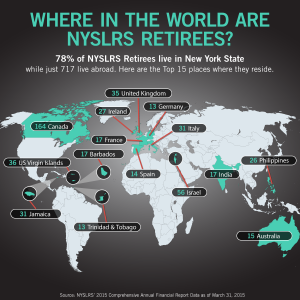 However, all NYSLRS retirees spend at least some of their income to the benefit of local businesses, and they are responsible for an estimated 66,100 jobs as a result. Content last revised March 16, 2017. This entry was posted in General News, NYSLRS Retirees, Retirees and tagged CRF, Economic Impact of Retirees, ERS, National Institute on Retirement Security, New York State & Local Retirement System, New York State Common Retirement Fund, NIRS, NYSLRS, NYSLRS Retirees, PFRS, Retirees Abroad, Retirees Contribute, Retirees Create Jobs, Retirees Economic Impact, Retirees Economic Power, retirement on March 16, 2017 by NYSLRS. Content last revised November 2, 2016. 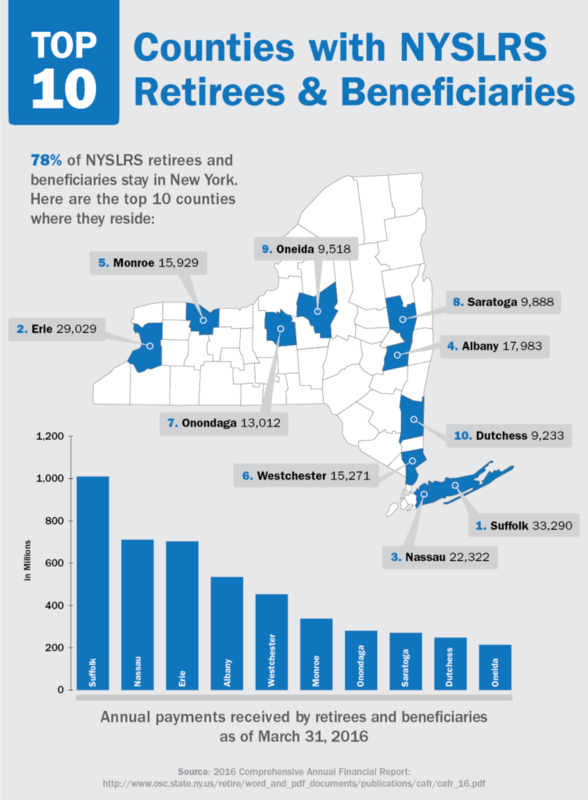 This entry was posted in General News, NYSLRS Retirees, Retirees and tagged Economic Impact of Retirees, ERS, Information is the Key, New York State & Local Retirement System, New York State Common Retirement Fund, NIRS, NYSLRS, NYSLRS Retirees, PFRS, Public Pensions, Retirees Contribute, Retirees Create Jobs, retirees pay taxes, retirement, Strong New York, this public pension system works on November 2, 2016 by NYSLRS. 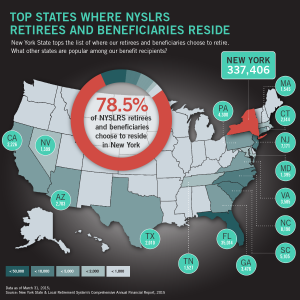 The administrator of the New York State & Local Retirement System (NYSLRS) and trustee of the New York State Common Retirement Fund, State Comptroller DiNapoli also noted that, of NYSLRS’ 430,308 retirees, 78 percent of them — 337,406 — have chosen to live in New York. 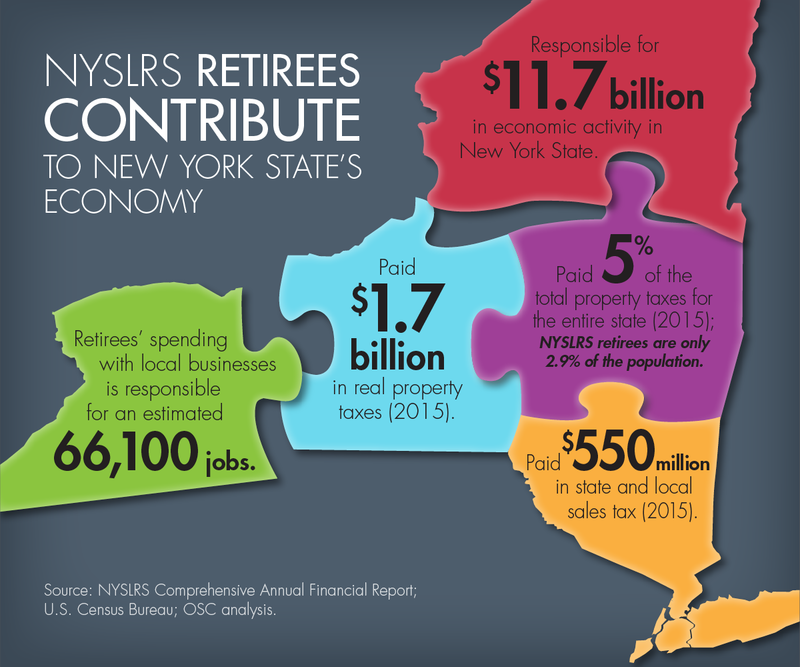 This is important, the State Comptroller explained, because the pension money paid to retired state and local public employees’ flows directly back into our communities, stimulating and growing our local economies. 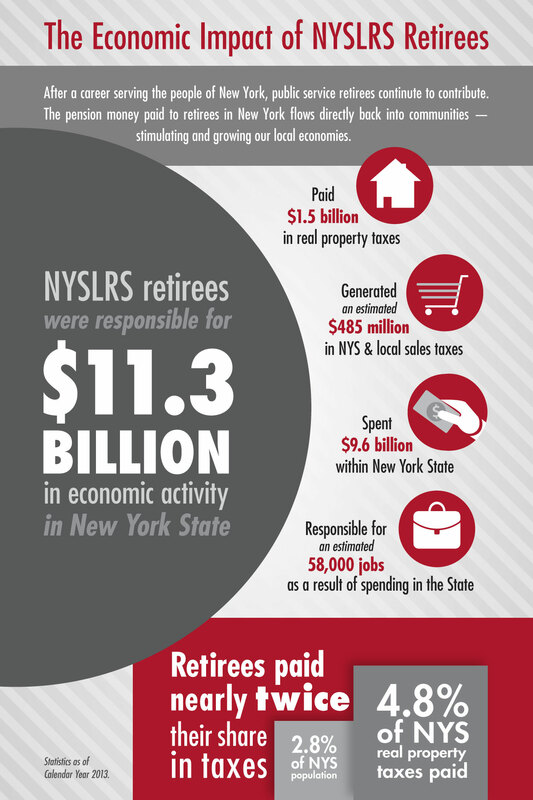 During calendar year 2014, NYSLRS retirees were responsible for $12 billion in economic activity in New York State. Content last revised November 4, 2015. This entry was posted in General News, NYSLRS Retirees, Pension Fund, Retirees, Videos and tagged Comptroller Thomas P. DiNapoli, ERS, New York State & Local Retirement System, New York State Common Retirement Fund, NYSLRS, NYSLRS Retirees, PEF, PFRS, Public Employees Federation, public pension system, Retirees Contribute, Retirees Create Jobs, retirees spending, Retirees Taxes, retirement, Strong New York, this public pension system works on November 4, 2015 by NYSLRS.